A year after restaurant reviewing service Zomato entered the South African market, it has rolled out a revamped look across its Web and mobile platforms. The new website, which has a more social element to it, gives users personalised recommendations from trusted contacts. Zomato founder and CEO Deepinder Goyal says before the advent of the Internet, people relied on people’s opinions for restaurant discovery. A new Food Feed feature, similar to Facebook’s layout, lets users who are logged in see content from their connections, including restaurants visited, rated and reviewed, and pictures uploaded, making for more real-time social discovery of new places. The enhanced social layer, which displays filtered results from a user’s trusted network, means people now have to log in to use Zomato. Unregistered users can no longer make use of the database to view menus or reviews when searching for a new restaurant. Zomato says that the revamped product has been built on simple idea that individuals’ preferences vary, and that a more trusted network results in quicker and easier decision-making. The revamped site and mobile app have brought changes to the design and user experience. The search flow has been redesigned so users can find recommendations with fewer clicks, while restaurant ratings have been “normalised”, preventing listings from being clustered within a certain range. Enhanced spam control keeps out “junk” reviews. 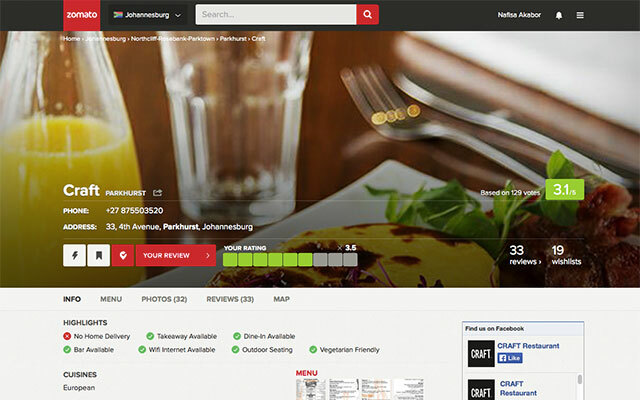 Zomato has 2 520 listings in Johannesburg, 521 in Pretoria and 551 in Durban. Cape Town has 1 930 eateries listed, including restaurants in Stellenbosch, Paarl and Franschhoek. It visits all eateries in person and manually captures the latest menu, address details, contact numbers, average costs, operational hours and maps.